known medically as malignant neoplasia, is a large group of diseases involving unregulated cell growth. In cancer, cells divide and grow uncontrollably, forming malignant tumors, which may invade nearby parts of the body. It is accepted by most oncologists that cancer has ,hidden several years of life before being detected.Dr. André Gernez developed in the 1970s a Therapy of active prevention of cancers whose essential principle is the destruction of cancer cells as they arise and before they can form a detectable and difficult to cure cancer.To achieve this goal and the result effectively prevent the occurrence of cancer of all types, regardless of their location (artery, brain, pancreas, lung, prostate, kidney, breast, etc..) And whatever their causes (genetics, pollution, smoking, etc..) recommends a course of 40 days, starting from the age of risk that is to say about 35 years and renew every year to destroy each year nascent cancer cells in the body and make impossible the formation and development of a cancerous tumor. The treatment period should be long enough, so that the majority of cells in the body has time to go through a divisional phase, and the cell division takes place, specifically in anticancer conditions and also so that the action on the mutated cells can occur. This period corresponds biologically to 40 days.The best time to practice anti-cancer treatment is in the early spring or late winter . It is especially essential for people of both sexes aged 35- 40 to 70 years, according to what emerges from the observation of the curve of cancer mortality. Considering that it takes 7 to 8 years between the birth of the first cell and the emergence of clinical cancer, it would be unwise to wait until the age characterizes high cancer mortality. Before this age, the risk of cancer is statistically low (except in predestined groups by the profession, and except inheritance, etc..). After 70 years, cancer mortality is declining in favor of other causes ... the cure fight elsewhere, too, though not specifically. The treatment consists of three main parts: an initial phase based on food reduction,diet, then a supplementation with vitamins and trace elements, and in the final phase, the destruction of cancer cells by taking anti-cancer and anti-mitotic drugs in very low dose. carcinogenesis password from 35.7% to 18.7%. that can make do without oxygen ,replacing it by fermentation , are cancer cells. Correction of hypoxia (decreased oxygen in the tissues) is a factor that promote normal cells. with catalyser of substitution.Why this magnesium deficiency has general implications ? cell division . Magnesium is directly involved in the cells normally perform their division. favorable to all cancer cells in the body of the cell selection,.magnesium deficiency is a fact that is widespread and many physicians prescribe it. Given the important role of this catalyst for healthy cells prevalence over cancer cells, it is necessary to ensure adequate fixation in the body. Food intake can be more than enough if we had a permanent use of products that are rich of it. But the diet may not be enough to fill a deficiency in few weeks , especially as cell attachment and recharge this catalyst is very slow. That is why it is important first to exclude the use of alcohol during the treatment ( alcohol opposes magnesium fixation) . - In case of chronic organ disease, curing period should be adapted and include the best as possible functional rest of that organ . Gastritis , colitis, bronchitis, etc. . Often neglected because rebels to curative treatment, must be given special attention , even if temporary , to alleviate the burden placed on remaining healthy cells , especially as chronic diseases are the bed of cancer. The last day of the cure period is the direct destruction by anticancer drugs , abnormal cells that could withstand the natural extinction when the cell is restored habitat in a status that does not lend itself to survive. This purge residual embryos have reduced to a few cancer cells (16 on average at the end of the first year of evolution) , which still pollute bodies , complete cleaning of the body. We have seen that involves the use of anticancer drugs at a very low dose ( the dose required to destroy cancer is proportional to the number of cells it contains and this dose , stage a dozen cells is negligible ) . The use of these anticancer drugs (also used for other diseases such as chronic arthritis or psoriasis ) may, however, represent , by their abuse or wrong dosage , a toxic hazard and therefore a clear formulation and to review by the physician. this stage of active prevention must involve methods of oxygenation. 2) - 8 day period with the use of colchicine (1mg/jour) which ensures the blocking of cell division phase. 4 )- period of 2 to 3 days with a slight antimitotic, eg chloral hydrate (50 mg 3 times a day 3 days). 5)- the treatment has to be repeated annually. DO WE HAVE CONFIRMATION OF SUCH A METHOD? The answer is yes. Here are some facts that corroborate. anticancer, 80% of them escape such a fate. long been the fraction of the population less affected by cancer. found the incidence of cancer in the general population. a) it is a low cost therapy that clearly could help many countries where cancer has a big incidence, to save many lives and a lot of money, by investing in prevention rather than spending,in expensive therapies that are unefficient in certain types of cancer like leucemiae, brain cancer,mesothelioma, and other cancer when they are diagnosed very late. vulnerable because there are still a limited number of cells. This rule is essential. 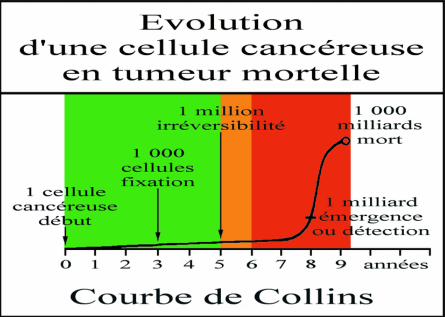 years from the appearance of the first cancer cell. A cancer in formation is 5 or 6 times at the risk of being destroyed by the annual cures and this is a very wide safety margin. Nucleic acids have an important range of interactions with Mg2+. The binding of Mg2+ to DNA and RNA stabilises structure; this can be observed in the increased melting temperature ™ of double-stranded DNA in the presence of Mg2+. In addition, ribosomes contain large amounts of Mg2+ and the stabilisation provided is essential to the complexation of this ribo-protein. A large number of enzymes involved in the biochemistry of nucleic acids bind Mg2+ for activity, using the ion for both activation and catalysis. Finally, the autocatalysis of many ribozymes (enzymes containing only RNA) is Mg2+ dependent (e.g. the yeast mitochondrial group II self splicing introns). Magnesium ions can be critical in maintaining the positional integrity of closely clustered phosphate groups. These clusters appear in numerous and distinct parts of the cell nucleus and cytoplasm. For instance, hexahydrated Mg2+ ions bind in the deep major groove and at the outer mouth of A-form nucleic acid duplexes. Selenium is a chemical element with atomic number 34. Its symbol is Se. It is a non-metal chemically similar to sulfur and tellurium. Selenium is a oligonutriente present in nature that is an essential nutrient, which is involved in numerous biological functions . Natural sources of selenium are fish, meat, meat offal, milk and dairy products, yeast, grains, nuts, mushrooms, fruits and vegetables . The selenium in foods is present in inorganic form (as selenite) is in organic form (as selenomethionine and seleniocisteina). Although it is toxic in large doses, selenium is an essential micronutrient for animals. In plants, it occurs as a bystander mineral, sometimes in toxic proportions in forage (some plants may accumulate selenium as a defense against being eaten by animals, but other plants such as locoweed require selenium, and their growth indicates the presence of selenium in soil). See more on plant nutrition below. Selenium also plays a role in the functioning of the thyroid gland and in every cell that uses thyroid hormone, by participating as a cofactor for the three of the four known types of thyroid hormone deiodinases, which activate and then deactivate various thyroid hormones and their metabolites: the iodothyronine deiodinases are the subfamily of deiodinase enzymes that use selenium as the otherwise rare amino acid selenocysteine. (Only the deiodinase iodotyrosine deiodinase, which works on the last break-down products of thyroid hormone, does not use selenium). Selenium may inhibit Hashimoto's disease, in which the body's own thyroid cells are attacked as alien. A reduction of 21% on TPO antibodies was reported with the dietary intake of 0.2 mg of selenium. Increased dietary selenium intakes reduce the effects of mercury toxicity and it is now recognized that the molecular mechanism of mercury toxicity involves irreversible inhibition of selenoenzymes that are required to prevent and reverse oxidative damage in brain and endocrine tissues. From about three billion years ago, prokaryotic selenoprotein families drive the evolution of selenocysteine, an amino acid. Selenium is incorporated into several prokaryotic selenoprotein families in bacteria, archaea and eukaryotes as selenocysteine, where selenoprotein peroxiredoxins protect bacterial and eukaryotic cells against oxidative damage. Selenoprotein families of GSH-Px and the deiodinases of eukaryotic cells seem to have a bacterial phylogenetic origin. The selenocysteine-containing form occurs in species as diverse as green algae, diatoms, sea urchin, fish and chicken. Selenium enzymes are involved in utilization of the small reducing molecules glutathione and thioredoxin. One family of selenium-containing molecules (the glutathione peroxidases) destroy peroxide and repair damaged peroxidized cell membranes, using glutathione. Another selenium-containing enzyme in some plants and in animals (thioredoxin reductase) generates reduced thioredoxin, a dithiol that serves as an electron source for peroxidases and also the important reducing enzyme ribonucleotide reductase that makes DNA precursors from RNA precursors. Trace elements involved in GSH-Px and superoxide dismutase enzymes activities, i.e. selenium, vanadium, magnesium, copper, and zinc, may have been lacking in some terrestrial mineral-deficient areas. Marine organisms retained and sometimes expanded their seleno-proteomes, whereas the seleno-proteomes of some terrestrial organisms were reduced or completely lost. These findings suggest that, with the exception of vertebrates, aquatic life supports selenium utilization, whereas terrestrial habitats lead to reduced use of this trace element.Marine fishes and vertebrate thyroid glands have the highest concentration of selenium and iodine. From about 500 Mya, freshwater and terrestrial plants slowly optimized the production of "new" endogenous antioxidants such as ascorbic acid (Vitamin C), polyphenols (including flavonoids), tocopherols, etc. A few of these appeared more recently, in the last 50–200 million years, in fruits and flowers of angiosperm plants. In fact, the angiosperms (the dominant type of plant today) and most of their antioxidant pigments evolved during the late Jurassic period. The deiodinase isoenzymes constitute another family of eukaryotic selenoproteins with identified enzyme function. Deiodinases are able to extract electrons from iodides, and iodides from iodothyronines. They are, thus, involved in thyroid-hormone regulation, participating in the protection of thyrocytes from damage by H2O2 produced for thyroid-hormone biosynthesis. About 200 Mya, new selenoproteins were developed as mammalian GSH-Px enzymes. Zinc is a chemical element with atomic number 30. Its symbol is Zn.Zinc is an essential trace element, present in the organism in quantities greater than any other trace element apart from iron. Zinc is an essential trace element in the life of humans and the higher animals: a zinc deficiency seriously affects body growth and weight gain. The zinc constitutes parts of protein with zinc fingers and enzymes with antioxidant action such as superoxide dismutase, or with catalytic functions such as carbonic anhydrase, the alcohol dehydrogenase, and lactate dehydrogenase, enter in the constitution of at least 20 enzymes. Zinc is a cofactor that interfers ,in many biological functions and therefore participates in protein synthesis including DNA and RNA; The formation of the fetus and his weight gain ;As a necessary element for the moltiplication and cellular maturation during wound healing. Zinc is also involved in the operation of sight, smell, touch and memory, and is responsible for the good functioning of these, and a zinc deficiency will cause malfunctions. Metallothioneins (MTs) are a family of low molecular-weight proteins that are silenced during colorectal cancer progression, mainly through epigenetic mechanisms, and this loss is associated with poor survival. In this article, we show that overexpression of the MT1G isoform sensitizes colorectal cell lines to the chemotherapeutic agents oxaliplatin (OXA) and 5-fluorouracil (5-FU), in part through enhancing p53 and repressing NF-B activity. Despite being silenced, MTs can be re-induced by histone deacetylase inhibitors such as trichostatin A and sodium butyrate. In fact, this induction contributes to the cytotoxicity of these agents, given that silencing of MTs by siRNAs reduces their growth-inhibitory activities. Zinc ions also potently enhance MTs expression, and are also cytotoxic to cancer cells. We show for the first time that OXA and 5-FU induce higher levels of intracellular labile zinc, as measured using the fluorescent probe FLUOZIN-3, and that such zinc contributes to the activation of p53 and repression of NF-B. Addition of zinc enhanced growth inhibition by OXA and 5-FU, and was also capable of re-sensitizing 5-FU resistant cell lines to levels comparable to sensitive cell lines. This effect was metallothionein- independent, since silencing MTs did not affect zinc cytotoxicity. In conclusion, we show that MTs induction and zinc administration are novel strategies to sensitize colorectal cancer cells to presently utilized chemotherapeutic agents. c) the use of cortisone at the end of therapy to restart the mitosis, poses some problems,One of the potentially harmful effects of cortisone, however, is to suppress the immune system (a possible explanation of the correlation between stress and illness).The immunosuppression instead of helping to fight against microcancers, could have the opposite effect ,and help the micro-cancer to continue to moltiplicate. d)more than 400 micrograms per day of selenium can cause poisoning by selenium (selenosis). e)Excessive intake of zinc in the diet can cause deficiencies of other trace elements. The dose was much higher in the zinc requirements of an adult, which is calculated as 0.1 mg / kg / day. Zinc stimulates growth hormone IGF1 and testosterone, and high doses locks the protective role of selenium against prostate cancer. Similarly, zinc is a powerful stimulant for the immune response, but in large doses it weakens. -Libro:"POUR UNE POLITIQUE PUBLIQUE DE PREVENTION ACTIVE DU CANCER" Les propositions du Dr André Gernez,nouvelle édition, Dr Jean-Claude Meuriot, Dr Jacque Lacaze.